Press photo Donna Maree Hanson. Photo Credit. Taamati Te Rata. Donna Maree Hanson is a Canberra-based writer of fantasy, science fiction, horror, and under a pseudonym paranormal romance. She has been writing creatively since November 2000. She has had about 20 short stories published in various small press and ezines. In 2006, she won a Varuna Long Lines Fellowship for her novel in progress, Dragon Wine and was also shortlisted for the Varuna Manuscript Development Award that year. Donna has also had two of her short stories receive honourable mentions in Datlow and Windling’s years best fantasy and horror. In January 2013, her first longer work, Rayessa & the Space Pirates, was published with Harlequin’ s digital imprint, Escape (link here.) This novella length work is a young-adult, science-fiction adventure/romance (space opera). A sequel to Rayessa & the Space Pirates called Rae and Essa Space Adventures will be out with Escape on 8 May 2015. The first two books in the Dragon Wine Series, Shatterwing and Skywatcher, were published by Momentum (Pan Macmillan Australia’s Digital Imprint) in September and October 2014. 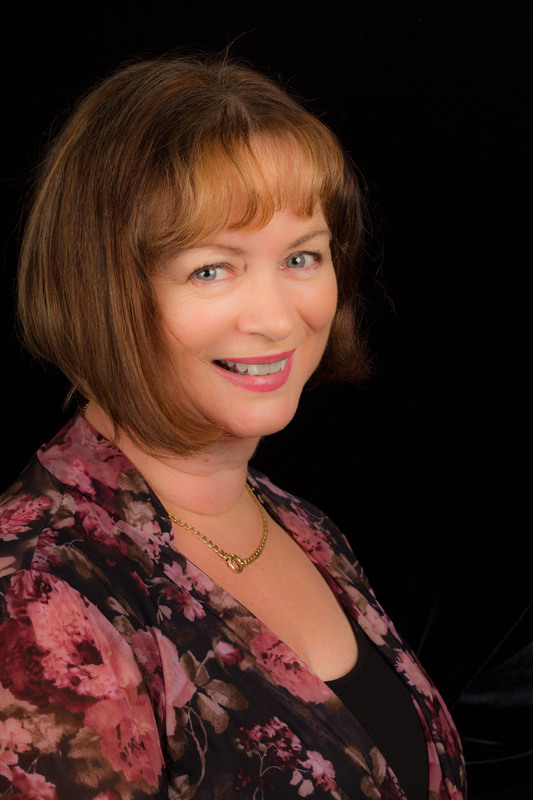 Donna received a Masters in Creative Writing from the University of Canberra in 2014 and also has a Graduate Certificate in Professional Writing (Editing). In April 2015, she was awarded the A. Bertram Chandler Award for “Outstanding Achievement in Australian Science Fiction” by the Australian Science Fiction Foundation. The citation is here. Donna is represented by Alex Adsett, of Alex Adsett Publishing Service. Link here. Donna wrote and published Australian Speculative Fiction: A Genre Overview, a non-fiction book providing valuable insights into Australian writers in the genre from around 2000-2005 with her imprint Aust Speculative Fiction. The overview book won an ACT Publishing Award in 2006. Her small press also published Kered’s Crown by Kaaren Sutcliffe and Johnny Phillips-Werewolf Detective by Robbie Matthews—both Canberra-based writers. Robbie Matthews’ collection of short stories was shortlisted for a 2009 Aurealis Award in the collected work category. Donna closed her small press in 2009. For CSFG Publishing she co-edited Encounters with Maxine McArthur and edited The Grinding House, a collection of stories by Kaaron Warren. In 2011, Donna read submissions for Angry Robot Books during its open submission month. In 2013, she was a judge in the graphic novel category for the Aurealis Awards. Donna has assisted with the editing and production other CSFG anthologies. She was also the inaugural president of the Canberra Speculative Fiction Guild and a prior Treasurer of the ACT Writers Centre. Donna was chair of Conflux (the highly successful Natcon) and Conflux 2, a smaller Canberra-based science fiction convention. These conventions were held in Canberra in 2004 and 2005 and started the writer-focus of subsequent Confluxes. In 2010, Donna was on the committee running the World Science Fiction Convention (Aussiecon 4) in Melbourne, being responsible for marketing and promotion of the event until she had to pull out due to family illness. 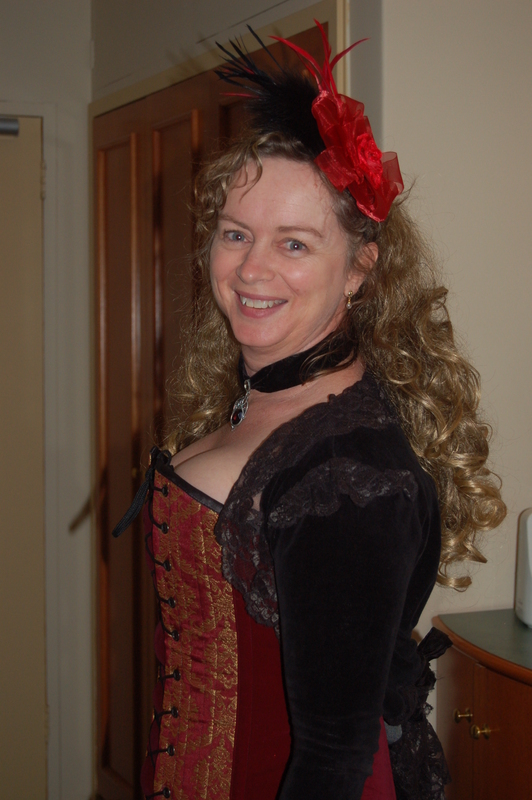 In 2013, Donna was co-chair of Conflux 9, the 52 Australian National Science Fiction Convention held over the Anzac Day long weekend in 2013. Donna has an interest in crafts, particularly exploring cake decorating, millinery, weaving, knitting, embroidery and sewing when she has time. She been known to dress in corsets, steampunk/Victorian dresses and Regency gowns. Since she’s been writing since 2000, she has developed many ways to procrastinate over the years. She doesn’t watch Free to Air television or cable but has a reasonably large DVD collection where she binge watches her favourite shows, such as Ripper Street, Game of Thrones, Almost Human, and retro watches Buffy, the Vampire Slayer and Angel, UFO and many others. Other DVD weaknesses include historical dramas, particularly if the name Austen is involved somewhere, all kinds of action, superhero, Star Wars, science fiction and fantasy bent movies. 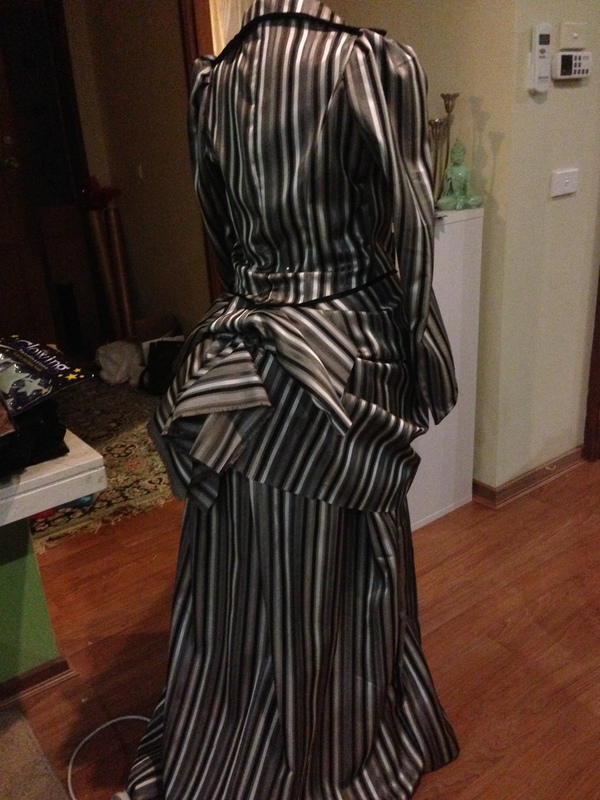 Awesome bustle dress creation by me. Donna lives with awesome writer, Matthew Farrer (aka The Dweeb), who shares her passion for geekery. He calls her The Dweebette! Matthew Farrer is known for his tie-in writing for Black Library (Warhammer 40K) and Wyrd Games (Malifaux) among others. You are most likely to see Donna dressed in 1950’s dresses at events so watch out for the petticoat.